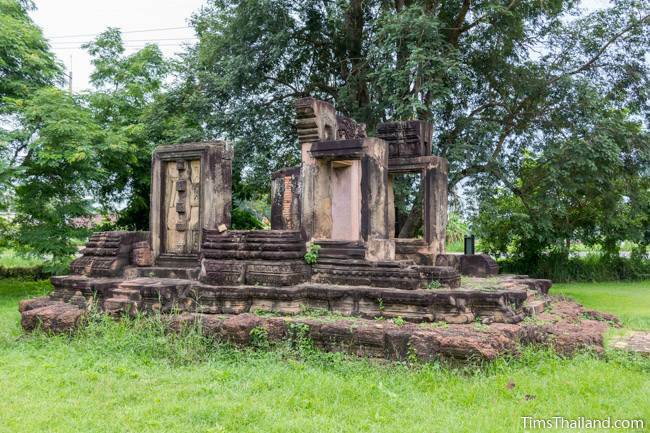 Casual travelers probably won't be too impressed by the modest remains of Prang Phakho (ปรางศ์พะโค), but it has some unusual features that Khmer enthusiasts will definitely want to see. 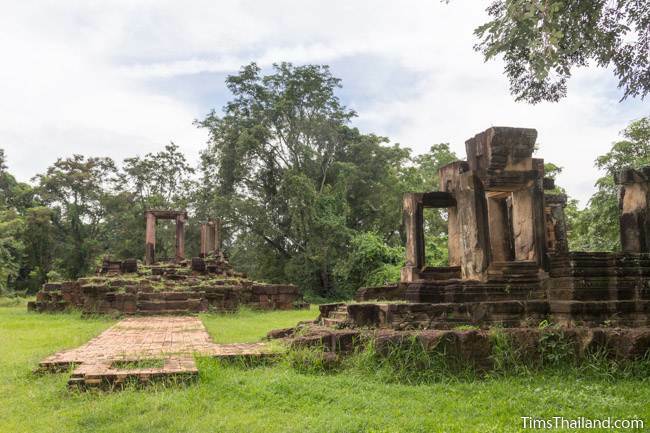 Built in the 11th century, it presently consists of just two buildings: an east-facing central prang and one "library" in front. 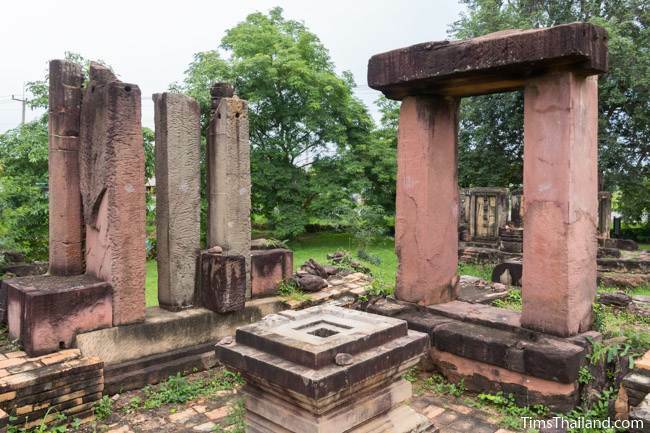 However, the ruins showed there was a second library across from the surviving one, and since three lotus-bud tops were found, there probably were (or were going to be) triple towers, meaning the site was likely much larger than its present appearance suggests. 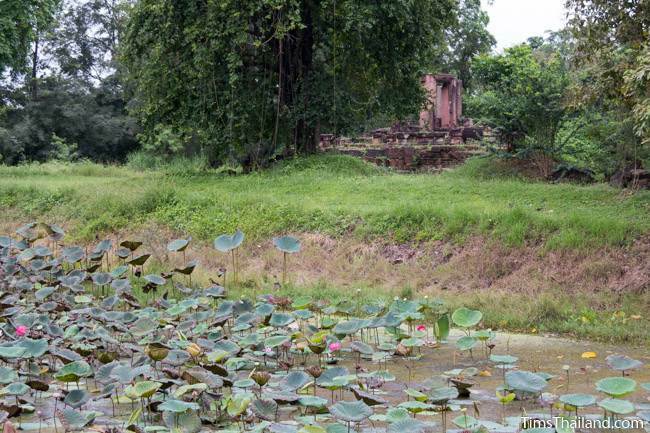 This photo of the three lotus-bud tops was taken in August 2013. 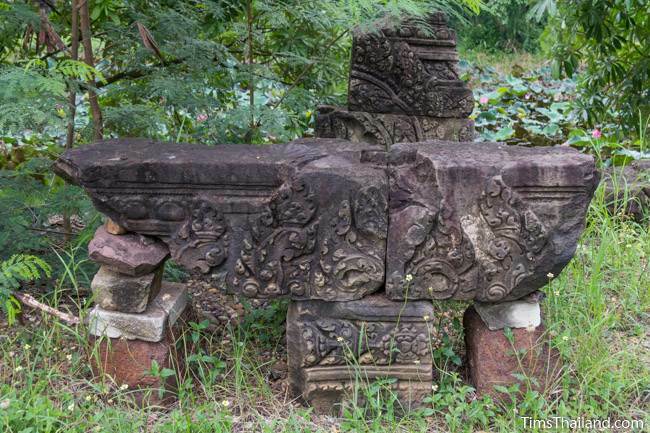 While most of the bricks and sandstone building blocks were long ago taken away, presumably to be used to make new buildings, there was not wholesale looting of the art (a combination of Khleang and Baphuon styles) and a lot of sculpture was recovered. 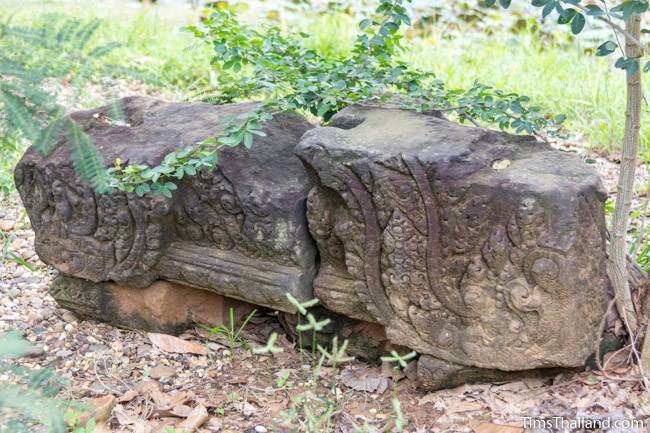 The best of it, including guardian lions (like those at Phimai) and a lintel with the god Indra were taken away for safekeeping at the Phimai National Museum and Maha Viravong National Museum, though plenty of pieces have been left behind. 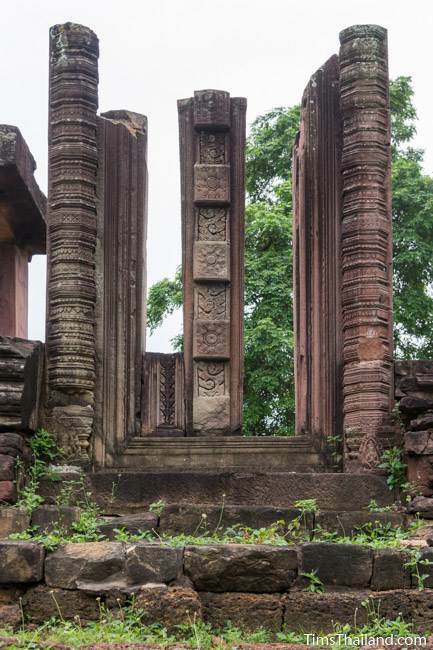 The only in situ lintel is on the front of the library. 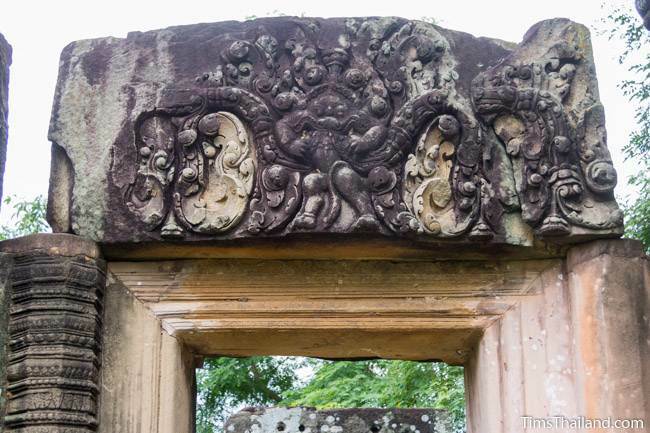 Many sections of it are damaged, but the kala eating a singha lion (a very rare subject in Khmer art) is in excellent condition. 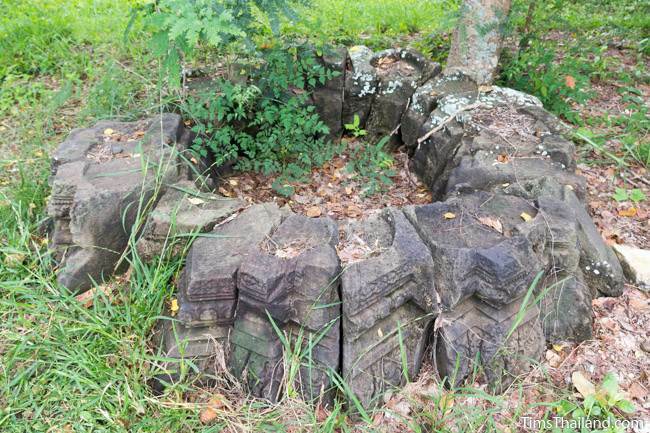 Although a rather large yoni was found here (no Shiva linga was recovered) there are Vishnu carvings too and it has been theorized that this could have been a Vaisnavite temple. 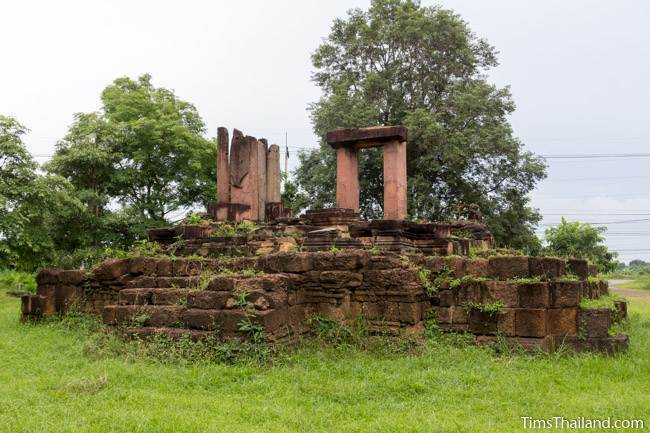 Both of the buildings (now linked by a modern brick walkway) sit on laterite bases and neither has any wall left, though there are still door and window frames giving the buildings some shape. 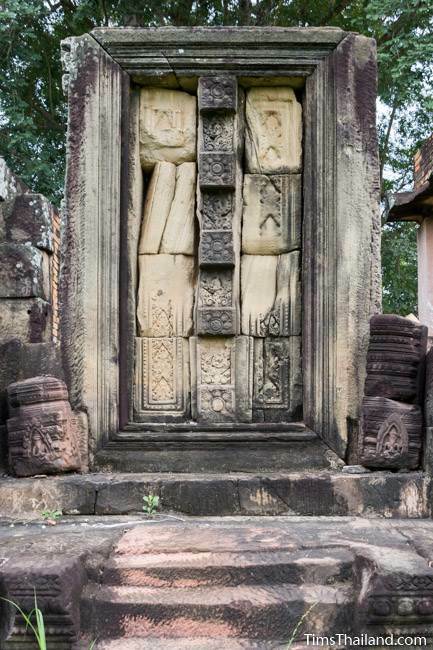 They each have a single entrance with false doors on the other three sides. The library is turned to the south rather than facing the prang directly as is the norm for libraries. 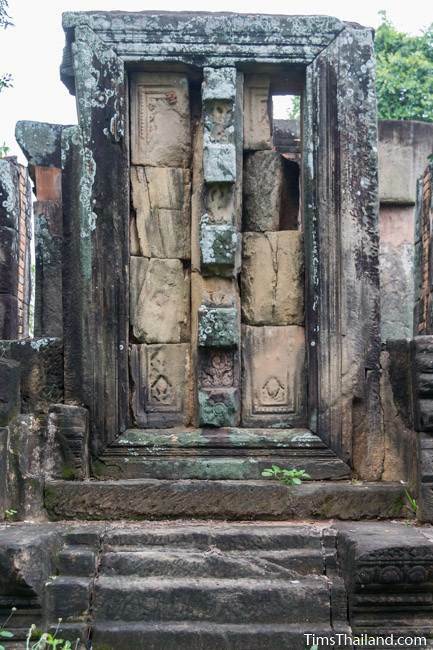 All four of its doorframes are mostly intact and so is the floral skirting around it. 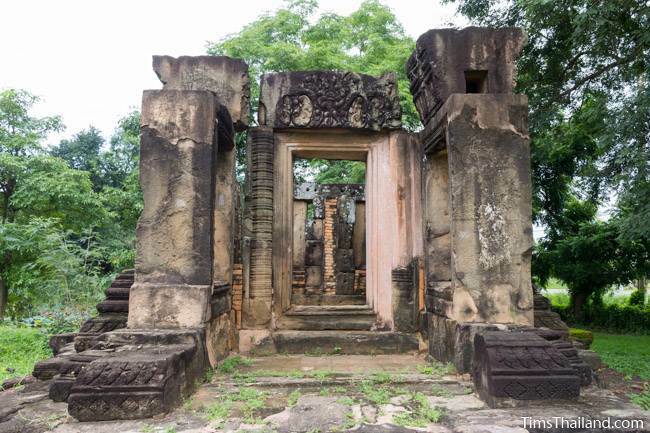 The main prang is less complete than the library, with the only noteworthy carvings being the colonettes and floral center panel of the north false door. 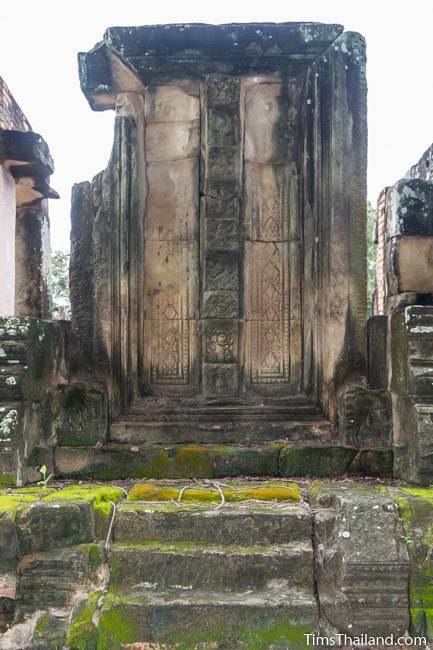 The yoni sits in the middle, though it may or may not have been kept here in the Khmer era. 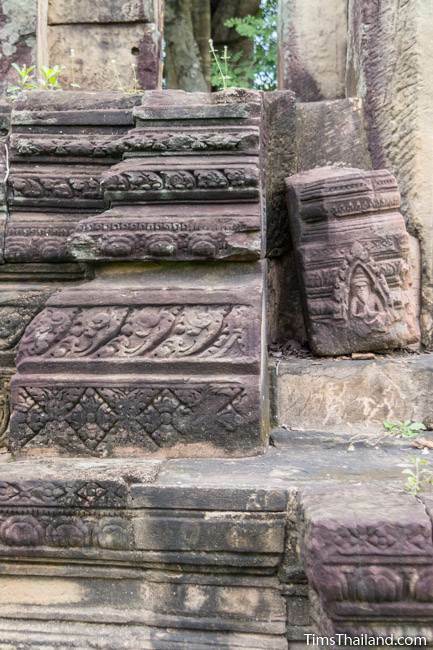 Other than the library's lintel, the most significant stonework are pieces of pediments, some of which were done in an unusual two-layer style (see the first picture below this paragraph) with what could be called a recessed lintel section surrounded by the pediment proper. 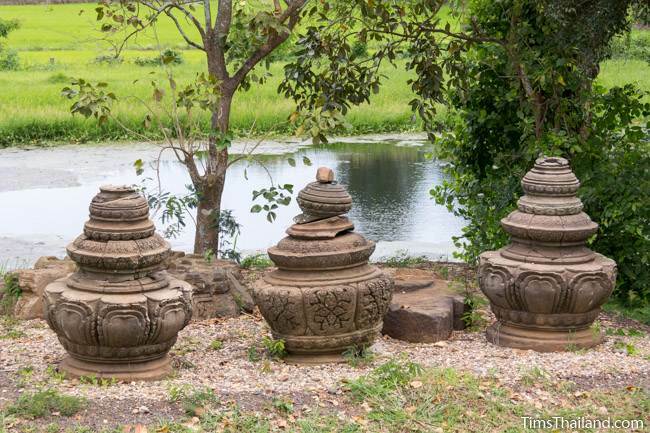 The three lotus-bud tops, almost completely unbroken (which makes you wonder if this temple was left incomplete and they were never installed. ), have since been removed from the site; an unfortunate, though surely wise decision. 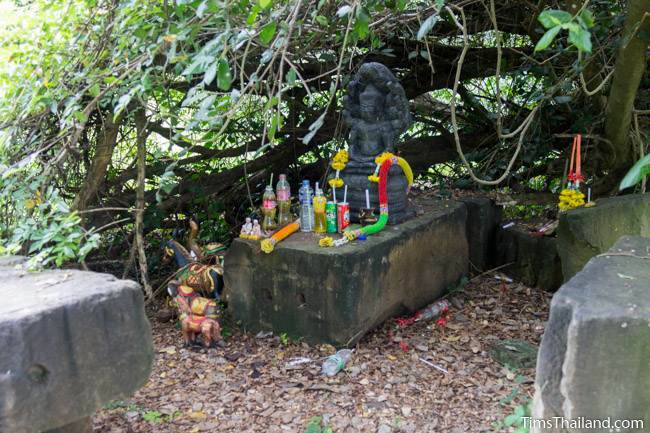 To the north, one large block hidden under a tree is used as a shrine for making offerings to the local spirits. 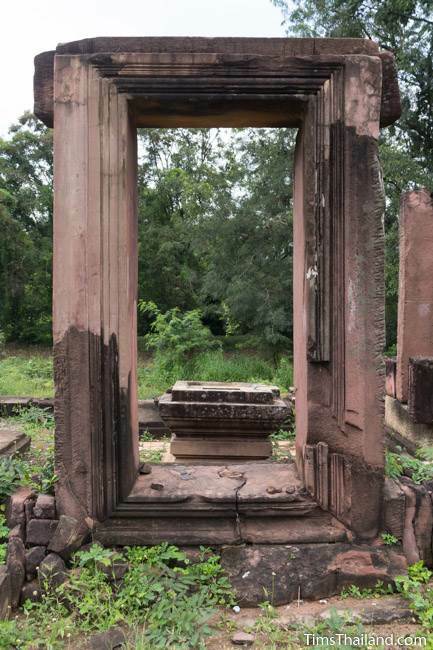 All of this excess material not unable to be used in the restoration is lined up against the moat, which still exists on all three sides, though the highway in front chopped off the east ends.